In brief welcome remarks after the translacion (transfer of the image of the Virgin of Penafrancia from one church to the other), Father Sanaghan, impressed with the big crowd that packed his parish church, has offered his parish church to be shrine of “Ina,” the revered Bikol name of Our Lady of Penafrancia. The Penafrancia festivities have been observed annually in the home city of Ina in Naga in the Philippines for the last 301 years from the second Friday up to the third Saturday of September. Other parts of the world where there are preponderance of Bikolano devotees have also observed the same festivities simultaneously. 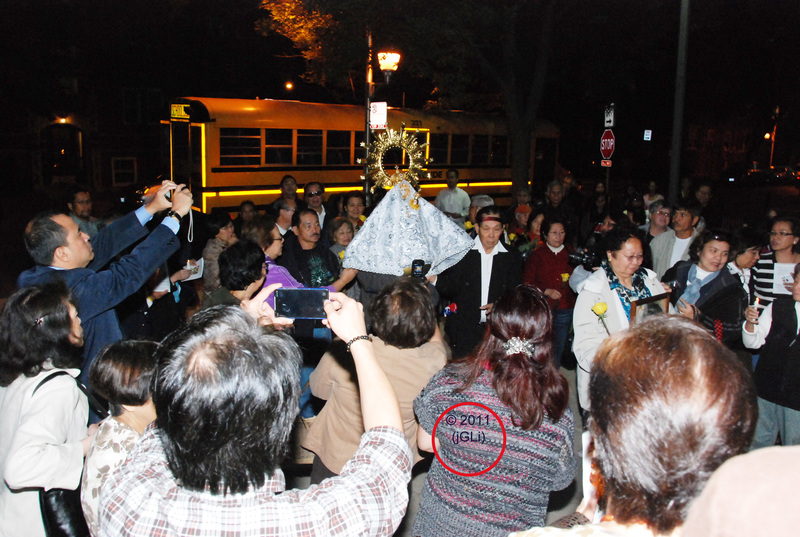 After a 30-minute fluvial procession from Belmont Harbor to Burnham Harbor in Lake Michigan in Chicago Saturday, the image of Penafrancia was returned to St. Matthias church on board a school bus along with the devotees. “Medyo ma-alon ang Lake. Pero hindi naman ako natatakot dahil kasama ko ang Virgen ng Penafrancia,” (The boat was buffeted by big waves of Lake Michigan. But I was not afraid because I was with the Virgin of Penafrancia. ), according to Avelino “Ben” Ner, one of the devotees, who joined the fluvial procession. But Daniel Hernandez, the three-year-old son of Larry Hernandez, who joined the fluvial procession, was dead tired, when the bus returned to St. Matthias church. His lola (grandmother), Dr. Dona L. Hernandez, who was also on board the boat, said Daniel might have felt dizzy during the trip on board the boat. The fluvial procession was the culmination of the nine-day novena to usher the feast of the patroness of Bikolnons from the Philippines. As in the eight previous nights, a chaplet, Rosary and Novena were held starting at 7 p.m. since Sept. 9 in St. Matthias Church. In Naga City, the fluvial procession is held at the Naga River. To sustain attendance of devotees, residents who hailed from different six provinces and three cities of the Bikol region took turns alternately in hosting the nightly vigil. But he is also thankful for the support of the Bikolanos notably the group called Bikol U.S.A., which was later renamed Bikol U.S.A. of the Midwest now headed by Ms. Evelyn R. Tolledo of Catanduanes in the Philippines but is now a resident at suburban Schiller Park, Illinois. Ms. Tolledo is this year’s ad hoc committee co-chair. At the mass during the Fiesta, Fr. John Era was the main celebrant assisted by Rev. Fr. Nelson Garcia and Deacon Roland Merced. 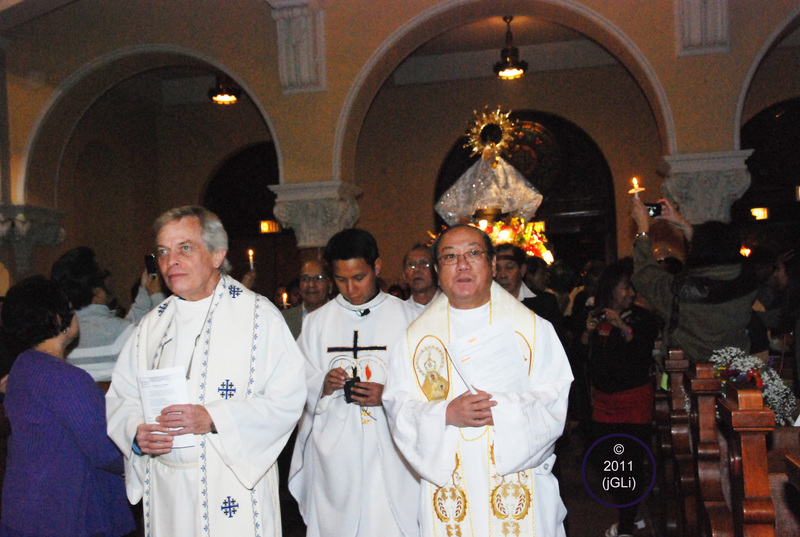 The nightly liturgy ministers included Fathers Nelson Garcia, John Era, Andre Beltran, Danilo Soriano, Leoncio Santiago, Tirso Villaverde, Joel Lopez and Noel Reyes. Members of this year’s ad hoc committee included Jimmy Alto, Monette Calderon, Amor Saenz, Delia Silva, Aida Joseph, Lura Gonzales, Dona Hernandez, Romy Sarcilla, Alice Llames, Lilia Untalan, Danny Auro and Fely Odiamar. In Naga City, on the second Friday of September, that is, September 9 this year, the image of the virgin and the Divino Rostro (Holy Face) are transferred, hence the term traslacion, from the Penafrancia Church to the Naga Metropolitan Cathedral by barefoot male voyadores or devotees. While at the Naga Metropolitan Cathedral, the faithful start the Novenario. In previous years, the image of the Our Lady of Penafrancia was kept at the Basilica. But last year, the 300th year or tercenary of celebration, it was brought back to its original home, Penafrancia Church. The festivities feature a fluvial procession on the ninth day of the novena bringing back the image to the Basilica for the Pontifical Mass. While only men can participate in the traslacion and fluvial procession, women devotees on the other hand have their own procession around the Basilica. 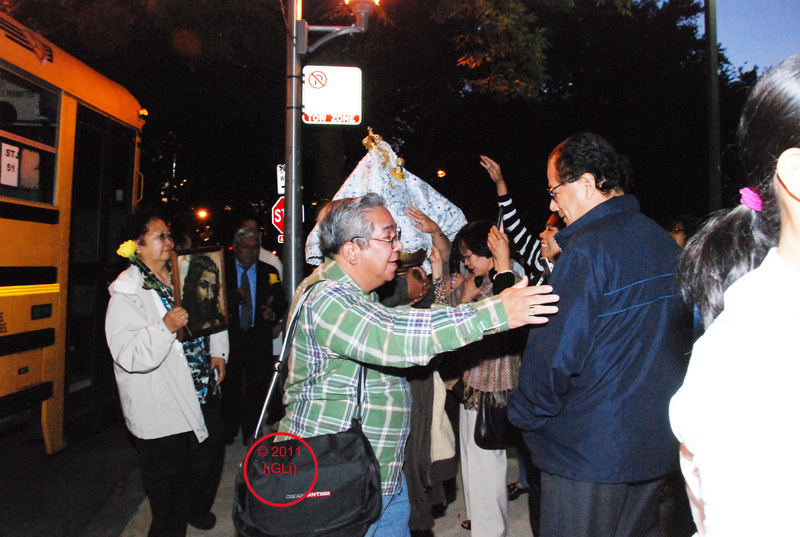 The image of the Virgin of Penafrancia is moved from the school bus after the fluvial procession towards the St. Matthias Church in the north side of Chicago, Illinois as it is met by female devotees last Saturday, Sept. 17. Photo shows foreground at left Roger “Boy” R. Odiamar, president of Confraternity of Our Lady of Penafrancia, talking to a devotee. The image of the Virgin of Penafrancia is surrounded by devotees as it is being brought inside the St. Matthias Church in the north side of Chicago, Illinois last Saturday, Sept. 17, after the fluvial procession. The image of the Virgin of Penafrancia is ushered inside the St. Matthias Church at the north side of Chicago, Illinois last Saturday, Sept. 17, after the fluvial procession, led by Fr. John Sanaghan (from left), Fr. John Era, and Fr. Nelson Garcia while devotees look on. Perhaps the most satirical of witticisms expressed about the Philippines during the Spanish times was made by a visiting French nobleman in a report to his country in 1766. « I am writing you from the other side of the globe, and may I even add from the 14th century ! » declared M. Le Gentil de la Galasiere who, steeped in the ideas of the then modern French Enlightenment, must have been intensely shocked about the medieval lifeways of Spain’s territory in Asia. The erudite Seigneur’s caustic esprit was only one of the volley of similar pointed comments hurled at the quality of the Spanish rule in the islands, criticisms which eventually stirred up some enlightened Spanish hearts into taking steps toward a better administration. Out of these attempts at reforms aimed primarily at improving the country’s unpredictable economy, one move was the institution of government-subsidized agricultural projects and incentives. Whereas years of economic dependence on the Chinese silk trade with Mexico neglected the natural potentials of the islands, the colonial government now turned its attention to the development of natural resources and the stimulation of agricultural activities. The much sought- after spices of yore no longer commanded a monopoly of interest; crops like sugar, tobacco, indigo and hemp began to be in demand. In 1834, when Spain at last officially opened Manila to international commerce, progress began to be seen in manifold manifestations, among which was art patronage. Perhaps no other painter’s life was more intimately interwoven with the course of newly prosperous 19th-century Manila than that of the early master, Justiniano Asuncion. Gifted with a durable life of 80 years, he witnessed prosperity coming upon the once languid city and bringing new turns in the destinies of its awakened inhabitants. As a consequence of this long life, his painting career reflected the artistic preferences of his flourishing milieu perhaps more faithfully than any of his contemporaries. Justiniano Asuncion was elected cabeza de barangay in the community of mestizos in Sta. Cruz, Manila. For this reason, he was ever after fondly called Capitan Ting. The biographer Manuel Artigas y Cuerva jotted a 14-sentence sketch of his life and called him modelo de honradez, an exemplar of tacto y prudencia. The Sta. 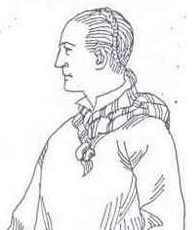 Cruz of 1816, when Capitan Ting was born still carried the features of what Le Gentil de la Galaisiere, 50 years earlier, referred to as the “fourteenth century”. As any other Christianized spot in the islands, the district reminded the monsieur of some medieval European faubourg: a self-complacent artisan’s village that only trembled when threatened with the fires of hell. Little surprise it is, therefore, that the quiet nest of sculptors, smiths, embroiderers and jewelry setters was noted for spectacular church processions, activities which must have absorbed the year-round material profits and efforts of its dexterous denizens. According to the medieval scheme of things, the fine arts were crouched within the level of the crafts. The painter, however much praised, was seated between the tailor and the carpenter. In fact, he had to enlist himself in a guild encompassing all citizens who practiced his profession. This guild system was a mechanism of the colonial government to facilitate the collection of tributes. Another medieval aspect of Sta. Cruz’ lifeways was the classification of its citizens into communities according to race- Chinese, mestizo or native. Each community elected its own officials and competed with each other in the civic and religious affairs of the district. The Gremio de Mestizos, to which the Asuncions belonged, since 1741 surpassed in prestige its father guild, the Gremio de Chinos.and continued to be the most influential group in the arrabal until the end of the 19th century. It is often said that artistic genius runs in the family. Justiniano’s lineage is a shining example. His elder brothers, Antonio, Ambrosio and Mariano, were all recognized by religious organizations for their talents as painters. Antonio even earned a flattering epithet, Fra Angelico Filipino! Manuel and Leoncio- Justiniano was the youngest son in a family of 12- maintained a sculptors’ shop and executed many life-size figures, like the Tercera Caida which was carried during Holy Week processions in their home district. 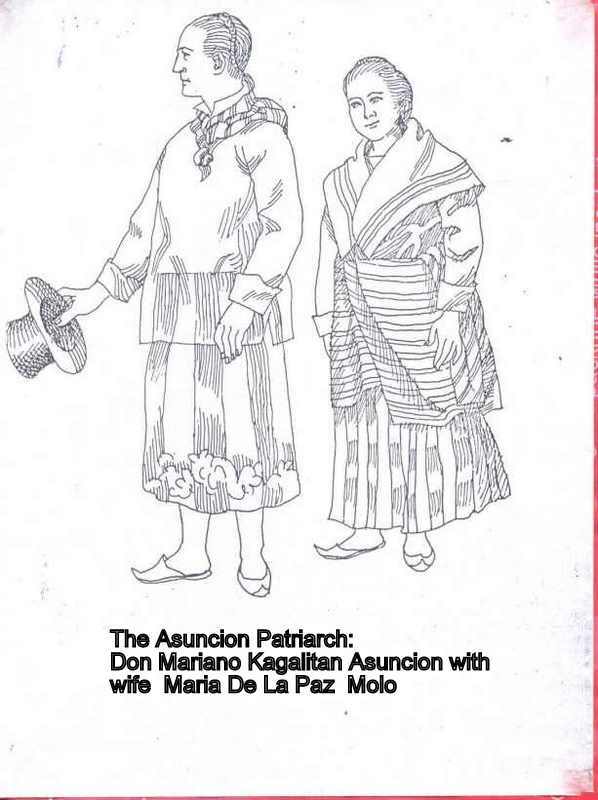 Neither were the Asuncions an ordinary mestizo family. Their father, Don Mariano, assumed the coveted position of cabeza de barangay in 1805. An engraving of his ancestor, copied from a paste original by Justiniano, depicts him in the powerful pose of a grand patriarch. Of interest is his costume. Typical of his mestizo class, he wears loose pantaloons, an equally loose camiza, intricately embroidered at the hems, and a collar kerchief to simulate the European cravat. His hair is gathered at the back of his head into a Chinese pigtail. Curiously, he wears a pair of slippers with curled toes. Perhaps it is important to mention that the family name was recently acquired. Don Mariano was originally surnamed Kagalitan. Perhaps the old man adopted a Spanish surname as he rose in position in society. The spirit of change was beginning to dominate the times. Neither did the ambiance of progress leave the artistic world untouched. When Justiniano was about six years of age, the painter’s lot as a craftsman was elevated to better status with the establishment of Escuela de Dibujo, the first public art school in the community. Since the painter now went to school, the respectability of his position became fairly assured. Thus when young Ting reached schooling age, he had not only exposed himself to the artistic influences of his brothers, he must have also attended the Escuela wherein Don Damian seems to have been the sole professor. When the school closed in 1834- “for lack of funds”- aspiring painters had to seek private tutorship from recognized masters. Both the lessons under Don Damian and those under private tutelage seem to have consisted of the same rigorous training designed to acquaint their pupils with the nuances of realistic painting, with the fastidious emphasis on details, as the standard of times dictated. The supreme test of this sensitivity to details was the limning of miniatures, religious portraits on a golden or ivory or cloth surface, usually the size of a thumb and later on framed on chains or rosary beads. Justiniano made many of these locket paintings but it is difficult to make infallible attributions of extant examples to his name. One authenticated early work establishes his affiliation to Don Damian and his contemporaries. This religious painting, wrought on copper sheet, is entitled “The Coronation of the Virgin”. A favorite subject of religious paintings, the original picture may have been a polychromatic estampa. The subject, as further interpreted by local painters, has acquired an Oriental grace, a visual flatness or lightness as done in very fine polish with the Chinese brush. The young Justiniano’ painting of the Virgin had a cool sweetness that emanated from cautious hands. Little drawings of native costumes and scenery such as those trajes painted by Don Damian in the 1820s grew in popularity as more foreign ships docked in the country. What today would be called picture post cards, these little mementos attracted foreign travelers no end. A recently discovered collection of these so- called tipos del pais was done by Justiniano to depict the attire of his times in the 1840s. This album attests to his mastery of water color in drawing the minutest details. A matter of interest is the fact that his album had both Spanish and English captions which hint that they were aimed at some English patrons. A thriving contemporary, Juan Transfiguration Nepomuceno, also drew similarly costumed figures to illustrate the French scholar Jean Mallat’s Les Philippines. In comparing the two albums, an ineffable difference is at once apparent. While Nepomuceno’s models looked like garbed mannequins, cold and poised, Asuncion’s are breathing humans, pulsating and alive. The characterization of these figures indicate his realistic capturing of the particular personality of his portrait sitters. Justiniano’s album de trajes was to become the standard to be copied, both in subject and configuration, by future magazine illustrations in his century. His influence is clearly evident beginning with the drawings of C.W. Andrews, the British illustrator of La Illustracion Filipina, a magazine which ran for publication between 1859 and 1860. By this time, Justiniano had married Justina Parafina. In February 25, 1853, he was elected cabeza de barangay de mestizos in his district like his father before him. During his term, he inaugurated a new street along the San Lazaro Hospital area which is known today as Oroquieta. By the 1850s, a considerable number of truly affluent Filipino families began to emerge as a result of the flourishing trade with British and American firms. With more money to spend on the amenities of life, tastes for leisure, entertainment and material acquisition began to change accordingly. In the arts, for instance, a marked shift in interest from religious to secular paintings arose not out of sheer irreverence on th clientele’s part, but because it was almost mandatory to equate one’s wealth with more mundane signs. Moreover, the new bourgeoisie’s success in business and agriculture and their eventual ascent to society had precipitated their growing importance as individuals. Understandably, in posing for a portrait, one invariably underscored one’s position or consequence. Understandably then the earliest known portrait painted by Capitan Ting was dated in the 1850s. The sitter was probably the most influential señor of his district, Don Paterno Molo y Agustin, businessman-proprietor of a chain of merchant boats that brought divers goods as far as Aparri. It was actually Don Paterno’s first name which was later adopted by his socially prominent and affluent descendants as their family name. When he posed for this portrait Don Paterno was in the twilight of his life and his son, the equally prestigious Don Maximo or Capitan Memo was already overseeing his business for him. Another early portrait executed by Capitan Ting is a half-body close up of his niece, Filomena, eldest daughter of his brother, Leoncio. This retrato is dated to the late 1850s by inference of the style of the model’s costume. 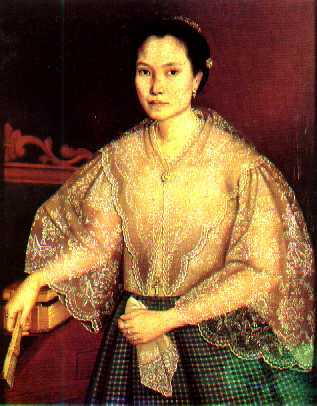 Interestingly, this is the only extant portrait depicting a Maria Clara of that period- the panuelo over a non-transparent blouse with striped and relatively tapered long sleeves. One can easily pick out Filomena’s costume among the female figures painted by the German Karuth in 1858. By the early 1860s, the affluent in the provinces caught the fever for portraits. The portrait painters of Manila now traveled to the provinces to seek the patronage of the town principalia. In Candaba today, in what was once a great house there used to hang the magnificent life-size portrait of Don Norberto Castor, a wealthy landlord of that feudal town. Don Berto’s importance is more than suggested by Capitan Ting in the portrait he painted in 1861. Togged in the fine European fashion of his days, the retrato speaks of a bygone era now romanticized in the movies. 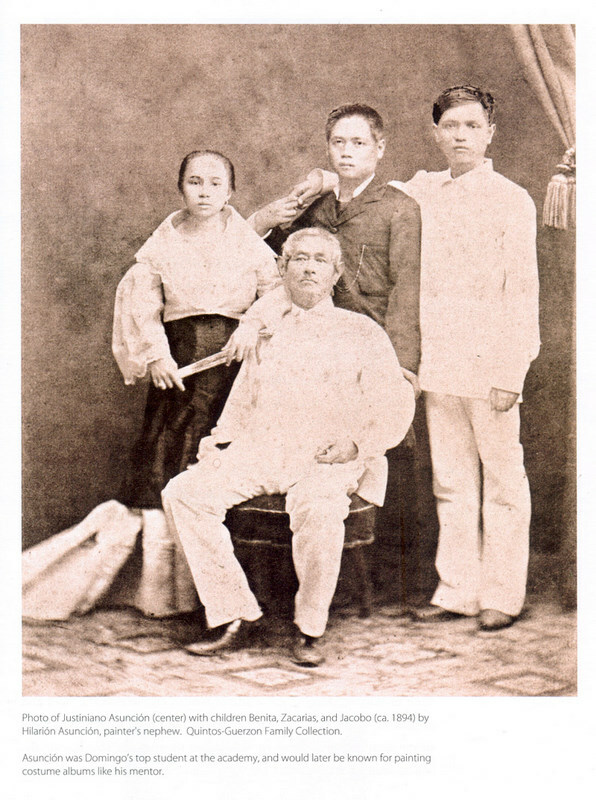 In the late 1870s, Justiniano went back to the Paterno mansion to paint Capitan Memo’s third wife, Doña Teodora, and his daughter, Dolores, composer of the ballad La Flor de Manila, now popularly known as Sampaguita.The three portraits executed by Capitan Ting for the Paternos- Don Paterno included- are of equal artistic merits all attest to the painters unsurpassed forte of capturing his sister’s individual personalities. Comparatively speaking, however, Don Paterno’s portrait would perhaps draw the interest of the more analytic viewers. Here, the subject is the venerability of old age rather than the relatively common place topic of Filipina femininity or the intricate embroideries of the Maria Clara. Capitan Ting seems to be playing homage to senility rather than to the worldly prominence of his sitter. His interest is in the steady gaze, the heavily drawn lips and the highly domed forehead. The conscious stiffness of his model’s carriage seems to be the wisdom of one who has had battles with life and emerges with more resolute views about it. The infirmity of age is however lightened by the rich designs of his embroidered cuffs and collar. The bold vertical line of the barong gives the old man one last tenacious display of strength and power. In contrast to the tone and temper of Don Paterno’s retrato, the one of Dolores is a visceral display of bourgeois ostentation. Justiniano justifiably eschews in this masterpiece the element of character- he is primarily concerned with what the eyes can behold rather than what the mind can analyze. The subject is a handsome young woman of the gentry class, and perhaps it should be so. Here, the actual and symbolic nuances of mundane prosperity is at once the order; the rich embroideries of the pañuelo and skirt, the rings on seven fingers, the bejeweled hairpin brooch, the matching fan and kerchief she clasps in one hand, the limpid eyes of one who has not seen much hardship in life, and the fine lips set in an aristocratic smile. The viewer is held back however of begrudging Dolores all her well-appointed fineries because Justiniano imbues her with a kind of inner warmth emanating from an Arcadian purity of mind and spirit. The eyes and the suppressed smile definitely conveys Dolores’ genial nature. Capitan Ting devotes equally meticulous attention to the exquisite embroidery of the pañuelo in the portrait of Doña Teodora. Yet still, the gracious-but-firm character, which a woman so young had to evolve as matriarch of Capitan Memo’s brood by two previous marriages and as manager of a complex joyeria, or jewelry store and workshop could not but illumine the smooth wood of the picture. The portraits executed by Capitan Ting, each a unique statement on the nature of a particular individual, always draw out fresh and varying experiences from their viewers. The opposite effect is what is rather felt in portraits done by his contemporaries who almost never went beyond idealizing their sitter’s physical appearance and whose work therefore when seen as a body, despite the variety of subjects, rather leave their viewers with a sense of the monotonous: that you’ve-seen-all-if-you’ve-seen-one-effect. The impression does not hold with the works of Capitan Ting. An admirer would, on the contrary, be even more amazed upon seeing his portrait of his niece Romana, daughter of his brother Antonio, married to a Carillo from Biñan. This, he painted in 1875. Here, the Master, can no longer be held back by the rigid artistic convention of his setting. The strict surveillance made upon the painter in the previous century conditioned the artist to merely copying engravings or actual objects and forbade him to express any personal interpretation of his subject. Now, the highly individualistic artist that Capitan Ting was, breaks away from the professional distance that he is expected to keep to his work and unabashedly suffuses it with his own presence, his own fine madness. His painting therefore reaches the level of a poet-artist’s manifesto. Unless other works of similar temperament come to the fore in order that a stylistic lyrical period among Manila’s painters of that time could be established, the portrait of Roman Carillio remains a phenomenon of expression in the entire history of painting in the Philippines. The presently known paintings dated to that decade are likeness-portraits by Antonio Malantik, Lorenzo Rocha, and Simon Flores. In 1875, neither Juan Luna nor Felix Resurrection Hidalgo had yet reached Europe to experience artistic emancipation. It could only have been through the spark of some book of artistic reproductions or the temperament of some circulating foreign novels that led the highly sensitive Capitan to the possible heights of freedom of spirit that the artist could enjoy in places outside of his environment. The decade during which Capitan Ting lived, the 1870s, was the decade of Cavite mutiny, a period of witchhunting and, as a whole, was stiflingly repressive. Perhaps such atmosphere was what precisely sent the Maestro to soar into some Elysian sphere. Indeed, the sublime aspiration to transcend the harsh, the bitter or the cruel is the one and only theme of the portrait of Romana Carillo. Just as Romana clasps a book, Capitan Ting’s oeuvre is an appeal to Reason, to Knowledge, to the Order that sometimes only art is capable of. Perhaps it is necessary to mention here that Justiniano went through a very bitter experience when in 1863, the calamitous earthquake that wrecked Manila, ruined his home and killed his bachelor brother, Ambrosio. There is much more to the merits of “The Woman with a Book” as a phenomenal milestone in the stylistic evolution of Philippine painting. In this work, Justiniano rises above the ground on which he and his artistic predecessors have hitherto worked. In painting the sunset behind Romana Carillo, he advanced the possibilities of the local realistic style, shifting it from its mere use as a technique to render life-likeness to its possible virtue as an idiom of temperament, a mode of self-expression. The landscape, not as a scene per se, but as an instrument to create atmosphere, was itself a novelty and the use of the colors of the sunset could have been a point of departure from the extremely linear predisposition of the current realism. Indeed, a highly creative person like the Capitan was now bored with the miniaturistic style and wanted to move to another direction in his art.His milieu, however, the entire powerful force actually lagging behind him compelled him to work with it. Hence the detailed workmanship of the portraits of the Paterno ladies. The spirit of the 1880s all the more called for the artist to record his setting in the graphic detail. The decade that cried for reforms- for material, specific changes- obliged the artist to graphically immortalize whatever was gained. After the earthquake of 1863, there was a rebuilding and renovating of church buildings and the most ornate of ornamentation possible, present evidences seem to say, was the natural defensive reaction toward the witnessed perishability of things. Four life- size oval frames painted by Capitan Ting, which used to hang on the predentives of Sta. Cruz Church depicting the figures of Saint Augustine, Jerome, Ambrose and Gregory the Grant were typical of the taste of the period. These works were done in the trompe l’oeil tradition, offering occasional distractions upon devotees who would look up now and then to wonder whether the adornment of the Saints’ robes were real or painted. An extant example he did in this phase of realism is the painting, “Virgen de Antipolo.” As in paintings of a truly realistic nature, the Capitan was able to capture the natural light that, translated to the canvas, projected the holy image’s priceless jewels to very high relief. Here is realism at its full development, and here was Capitan Ting, bored with it but desperately tied to it whenever commissioned by his powerful patrons. In the state of boredom, he often used his skills to amuse and confuse his guests and admirers alike. He is remembered to have painted on the downstairs wall of his newly built house, right under the window balustrade, a life-size infant falling in midair. The picture never failed to startle or evoke shrieks from passersby who at first glance thought the child was real. Once he also painted on the top of the chest, a scattering of very realistic coins, causing embarrassment to guests who stopped to pick them up. It was indeed time for Capitan Ting to amuse not only others but himself. The spirit of change seemed to be no longer working on his side. In 1884, Luna and Hidalgo become a sensational dou when they won major medals at the Exposition de Bellas Artes in Madrid. This achievement created a completely new turn in the artistic tastes of the time, for now artists who were educated abroad were lionized over those who stayed home and did not have the benefits of a European training. The wily ones began to copy Luna’s or Hidalgo’s techniques and concepts. Others who chose to remain as they were risked the danger of vanishing from the success scene. Capitan Ting who was in his 70s probably considered himself too old to compete with the young and trendy painters. In Manila’s art circles and to Capitan, it was clear that the miniaturistic style of realism had passed. Gray times too fell on the mestizo businessmen of Manila. The many foreign firms that had branches in Manila found faster market for their goods in the retail store of Chinese merchants. The Chinese, in turn, by virtue of their business connections with these big foreign firms, began to move steadily toward gaining control of the retail trade, once the domain of the mestizo businessmen. In the ambiance of this redoubtable financial losses, Capitan Ting’s adventurous son, Zacarias, set out for the province of Sorsogon about 1886, there to find better business opportunities where the Chinese had not yet gained foothold. It is said that his was the first “supermarket of Abueg town. With his marriage to a girl from nearby Masbate, Remedios Ramires, Zacarias so firmly established himself in that province that Capitan Ting felt sufficiently called upon to make the long and arduous trip to visit him. While in faraway Sorsogon, Capitan Ting learned of a new reform introduced in Manila. In a decree signed by the Overseas Minister of Spain, the guild system was abolished and replaced by a more systematized structurazation of the municipal government itself. By a stroke of the pen, the world of the Gremio de Mestizo, in which Capitan Ting figured most prominently, was cancelled. Capitan Ting never returned to Manila. In 1896 at the age of 80, Capitan Ting died in Abueg, Sorsogon, far removed from the middle class milieu that nurtured him and gave him fame. Rather ironically for such a meticulous portraitist, Capitan Ting’s own self-portrait does not exist today. It was kept in the house of one of his descendants in Malate, a southern district of Manila, which saw heavy damage not only during the battle for the liberation of the city in 1942, but also during two subsequent fires that leveled many houses to the ground. Yet more works of Capitan Ting, however, may surface. The Paterno family is supposed to have a representative collection. There has also been word that there are several works of Don Justiniano in Spain. When all his works are accounted for, another chapter in the life of Capitan Ting and his generation will reveal yet more delights. To see the scanned fotos of the original1975 publication of the Archipelago magazine, please click here. About the author: Santiago Albano Pilar is a professor of art history at the University of the Philippines College of Fine Arts. He teaches advanced courses in art history and connoisseurship in both the undergraduate and graduate programs. Pilar has authored several art books which include Juan Luna: the Filipino as a Painter, Pamana: The Jorge B. Vargas Art Collection and Domingo Celis: Inspired Calm and Harvest of Saints. He is associate editor of the Cultural Center of the Philippines‘ Encyclopedia of Philippine Art Volume IV: The Visual Arts. He was the 1980 TOYM (Ten Outstanding Young Men) Awardee for Art History and won the Araw ng Maynila Award: Tagapag-alaga ng Sining in 1996. He is also a consultant of exhibition projects for the Ayala Museum, Metropolitan Museum of Manila and Cultural Center of the Philippines. This post is my reply to this comment from Jeffrey, an Asuncion. This made me take out my copy of our Family Tree which I got from my sister Menchu. The research for this Family tree is largely credited to my uncle Dr. Ronaldo Asuncion. So there is something private in this post, with the purpose of connecting with the other relatives of mine who would be willing to supply more information about our lineage and/or help me answer Jeffrey’s inquiry.The Asuncions have always been closely associated with the town of Bulan and they are proud of their town. Personally, it interests me to know the music and lyrics of those anti- Spanish songs which my rebel great-grandfather sang and which led him behind bars. Composed or improvised? Unable to find an answer, I went back to Justiniano Asuncion in search of any clue that might shed a little light to the Zacarias issue. Again, I found no answer but names after names of Asuncions in politics, arts and sciences. Verily, I’m proud of my grandfathers! To write about Justiniano alone would fill up pages, a task I wish I could do. Well-known as “Capitan Ting,” Justiniano Asuncion was one of the leading Filipino painters in the 19th century. He was born on September 26, 1816 in Sta. Cruz, Manila. He was the 11th among 12 children of Mariano Kagalitan, whose family name was changed to “Asuncion” following the Claveria Decree. In 1834, he studied at Escuela de Dibujo, where he obtained his skills in painting. Sometime in 1855, he became capitan municipal of Sta. Cruz, Manila. Asuncion was the painter of the famous “Coronation of the Virgin,” the “Virgin of Antipolo,” “Filomena Asuncion,” and “Romana A. Carillo.” He produced life-sized paintings of San Agustin, San Geronimo, San Antonio, and San Gregorio Magno which were kept at the Sta. Cruz Church before the Pacific War. These precious canvases were destroyed when the Japanese bombarded the church in February 1945. His works mirror the mannerism of that period – the first 75 years of the 19th century. The portraitists of those time carefully delineated features of the head; the hands and other minor details with linear accuracy; usually disregarding tonal values and emphasizing hardness of effect. The University of Santo Tomas Museum owns one of Asuncion’s paintings, dated February 1862. An unsigned portrait of Fr. Melchor Garcia de Sampedro at the UST Museum is said to be the work of Asuncion. 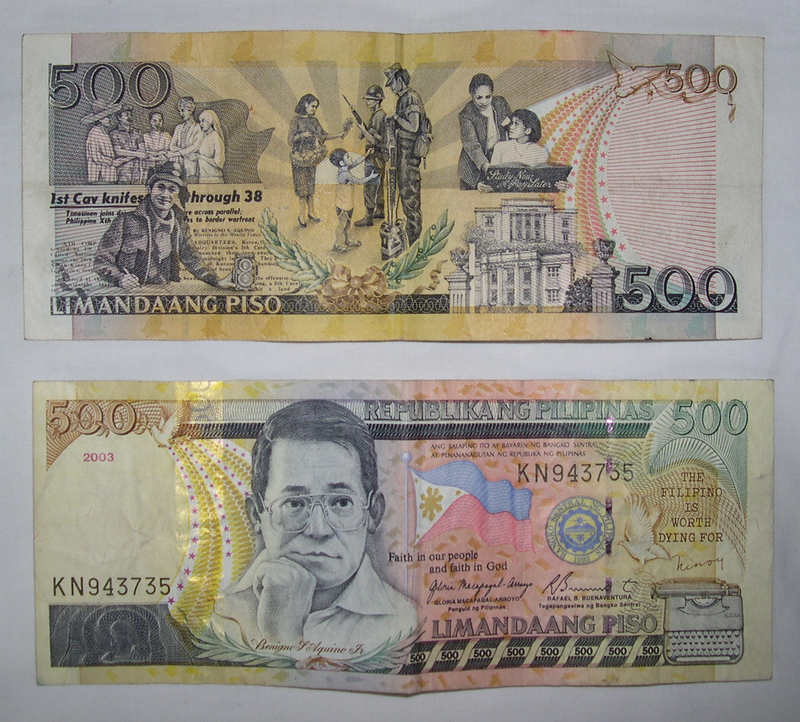 Most of his other works are kept as national treasures at the Central Bank of the Philippines Museum. On September 12, 1983, at the façade of Sta. Cruz Church in Manila, a marker was installed in his honor. He died in 1901 at age of 85. CCP Encyclopedia of Philippine Art, vol. IV. Manila: Cultural Center of the Philippines, 1994. 3. Quezon City: Filipinana Publications, 1986. (Justiniano Asuncion [1816-1901] was my great-great- Grandfather. Married to Justina Farafina Gomez. Their children: Benita, Zacarias, Marcelina, Jacobo, Gabriel and Martiniana. Justiniano’s father was Mariano Kagalitan, Sr. (later Asuncion) whose other children were: Manuel (1792), Antonio (1794), Victoria (1796), Mamerta (1798), Justo (1800), Mariano,jr. (1802), Epifanio (1806), Ambrosio (1808), Pascula (1811), Leoncio (1813), Canuta (1819), Theodoro (18??). Zacarias was my great-grandfather. With Juana Zalvidea he had two daughters, Guia and Consuelo. With Remedios Ramirez he had I think 9 children: Adonis, Jacobo, Rodolfo, Salvador, Justina, Justiniano, Zacarias [jr? ], Kenerino [founder of Southern Luzon Institute SLI, later KRAMS, married to Leonora Paras] and Digna. Adonis was my grandfather, grew up with him in our compound; in 1967 this wonderful grandfather of mine wandered all over Bulan South Central School looking for me with a handful of school supplies. It was just the opening of classes. He found me at the classroom of Miss Ceres McCoy Villareal (? ), my grade one teacher. Unforgettable! Rafael Asuncion ( national artist, he comes from the Leoncio Asuncion lineage. Leoncio was a brother of Justiniano). The eldest of four children, Jose Ma. Asuncion was born to Hilarion Asuncion and Marcela Raymundo of Sta. Cruz, Manila, on December 14, 1869. His father, the son of LeoncioAsuncion, a notable wood carver, was a portraitist and painter of religious subjects. 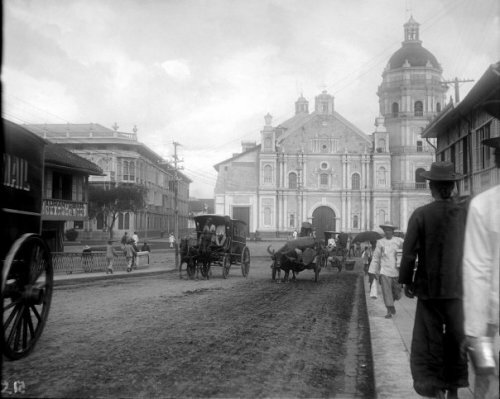 Asuncion enrolled at the Ateneo de Manila and obtained his Bachelor of Arts degree in 1888. At the time, he was studying at the Academia de Dibujo y Pintura, 1884-1889, then under the direction of Agustin Saez. Later, he transferred to the University of Santo Tomas to study under Felipe Roxas, who advised him to take further studies abroad. In 1890, both Roxas and Asuncion were in Paris. Asuncion received a grant from Agustina Medel, wealthy patroness of the arts from Manila and, later, owner of Teatro Zorilla. While in Paris, he met the Filipino painters Juan Luna and Felix Resurreccion Hidalgo and French artists. The following year he enrolled at the Escuela de Bellas Artes in Madrid, where he studied for four years, 1891-1895. He garnered first prize in general history of art and costumes and obtained second prize in theory, aesthetics, and philosophy of art. While at the Escuela, he befriended Vicente Francisco, a government pensionado in sculpture who was then enrolled at the same academy. In 1895, he sailed back to Manila, passed a competitive examination, and was appointed assistant in the Escuela Profesional de Artes y Oficios, in Iloilo, which position he held until November 1898. During the second stage of the Philippine Revolution, he served in the military administration and at one time took charge of the provisions for Filipino forces in Iloilo. He was transferred to the engineer corps as lieutenant under Gen. Adriano Hernandez. He helped in the construction of fortifications and trenches in Jaro, Leganes, La Paz and other strategic points. He also served under Gen. Pablo Araneta during the Filipino-American War. He was promoted to captain in February 1899, and three months later, to commander. When the Americans gradually gained ground on his forces, he retreated to the mountains. After some time, Asuncion and his wife, Juana Hubero, whom he married in September 1899, went to Calbayog, Samar to join his father who ran a grocery store. It was in his town that his wife gave birth to their first child, Vicente. A year later, finding Samar not yet wholly pacified, he moved his family to Tacloban, Leyte. He stayed there for four years, spending his time painting landscapes and telons for local comedias. He also engaged in photography, a business which he left to his brother Gabriel’s management when he left for Manila in 1905. He studied law, 1905-1909. He became a member of the Partido Independista, and was soon contributing articles on art and social and economic problems to the party’s organ, La Independencia. He also wrote for El Ilonguillo, La Voz de Mindanao, La Union, El Estudiante, El Renacimiento, The Independent, and Dia Filipino. Together with Rafael Enriquez, he founded the Sociedad Internacional de Artistas of Manila. Enriquez became its first president and Asuncion, its secretary. During their term, the Exposicion de Bellas Artes y Industrias Artisticas was held in December 1908, in time for the visit of an American squadron. This exhibition displayed more than 4,000 pieces of art. It aroused much interest and emphasized the need for a publicly supported institution in the arts. Asuncion was a Freemason. His masonic writings may be found in Hojas Sueltas and The Cabletow. His studies on the history of Philippine art and his sketches of Filipino costumes are among the few exceedingly valuable contributions on these subjects. The drawings numbered 215 when Manuel Artigas y Cuerva saw them, but they were never wholly published. Some appeared in print under the title, “El Traje Filipino, 1750 a 1830,” in Revista Historica de Filipinas, for August 1905. He could have left a much more significant tribute to his memory had this collection of studies and drawings been published. But after his death, it was neglected. When another painter, Vicente Alcarez Dizon, saw Asuncion’s scattered works, they were already in a bad state. He acquired them and used them later for his studies. Jose Maria R. Asuncion, the versatile Asuncion, painter, writer, soldier, educator, freemason, family man…what else shall we wish for? His father was Hilarion Asuncion, his grandfather was Leoncio, the brother of Justiniano. What else is there? Yes, he was the father of our living Asuncion artist Rafael Asuncion! Rafael has two other brothers,Vicente and Gabriel. That R in Jose’s name, his middle name, came from Marcela Raymundo, his mother, naturally. I’ve tried to know whether our patriarch Mariano Kagalitan was originally a native Muslim. He was for sure not a mestizo of any kind nor a Spaniard for he also had to change his family name later on to a Christian name ( which is Assumption, later developed to its present form Asuncion) under the Claveria Decree of 1849. What was known was that Mariano was one of those prominent people who resided in Sta. Cruz, that he was an accomplished artist himself who, as many of you know by now, produced master artists like Leoncio, Justiniano. Marianos’ ancestors were unknown to us until now. But about his wife Maria de la Paz Molo much is known. Maria De La Paz Molo’s father was Ming Mong Lo, who- according to the family history – was a Chinese apothecary of Mandarin origins and married a local woman. Ming Mong Lo adopted the Christian name Jose Molo upon baptism – and that was before the Claveria decree of 1849 and prospered as a merchant in the district of Binondo. He was said to have bequeathed five children, among them Paterno Joseph Molo and Maria de La Paz Molo. No doubt Maria de La Paz was half Chinese and half Filipino – assuming that her mother was not a “local” Chinese ( I have problem understanding what a “local” woman or man meant at that time). Her mother’s identity is totally unknown to me until a few days ago. My question was: Does this mean that the Asuncions could go as far as Raja Soliman as one among their patriarchs? This Great Maguinoo or Prince of Luzon could only be Raja Soliman, the famous King Of Tondo who initially resisted the Spanish adelantados. Resil’s argument had led me to wrong places which increased the confusion. Until I was summoned by Maning Yatco by way of his comment here at BO to visit Toto Gonzalez’ Blog Remembrance Of Things Awry because of the interesting discussions there about the Asuncion-Molo-Yatco’s connection. 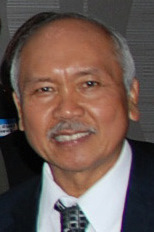 It was probably from the lineage of Paterno Joseph where this “blue blood” in the veins could be traced back among the succeeding generations of Paternos due to his marriage with Miguela Yamson, the daughter of Juan Yapson and Maria de la Cruz- the name which is claimed to be a descendant of Raja Soliman. (Note that during the introduction of the Claveria Decree, those natives who couldn’t read and write were just asked -or ordered- to draw a cross after their first names, hence the family names De La Cruz). But it was through this “marriage to Miguela Yamson that opened to Paterno Agustin opportunities available only to local royalty, or the “principalia”. hereafter, he was addressed as Don Paterno Agustin and qualified to run for public office”, commented Maxi and Jean Paterno of today. This started with the marriage of Mariano Kagalitan Asuncion to Maria De La Paz, the sister of Paterno Joseph. Paterno’s son Maximo was therefore a cousin of the first Asuncions — Justiniano, Leoncio, etc. It was Maximo who supported Justiniano Asuncion by commissioning portraits for the ladies of his house. Maximo had an astute sense for excellent investments and he had maximized his fortune in his capacity as gobernadorcillo of San Sebastian and Quiapo. He himself married thrice, the first with Valeriana Pineda, the second with Carmen De Vera Ignacio and the third with Carmen’s sister Theodora De Vera Ignacio whose portrait is shown above as painted by Justiniano. Hence, two things are clearer to me now: First, that the Asuncions have partly Chinese blood in their veins, second, that though they had also engaged in politics, like Mariano, Justiniano, etc., down to Don Zacarias and Adonis Asuncion their strength was not in politics, i.e., the way we understand “political strength” in the Philippines before and now , but it is in the arts and the humanities and sciences that they excelled and earned recognition even beyond their times. The attachment is an article authored by the now Prof. Santiago A. Pilar about Justiniano Asuncion entitled The Loving Eye For Detail which is a biographical sketch of the artist Justiniano Asuncion. I said authored by the now Prof. Santiago because the article was published 35 years ago in now defunct international magazine the Archipelago and that I don’t know if Santiago was already a professor at that time. I’ve tried to contact Professor Santiago to ask for his permission for the reprint of his article here in Bulan Observer but as of now I haven’t been successful. In any case. I consider it necessary not to let this article lay dormant for another decades before it will have its readers again. Indeed, for such a beautiful work, to risk being accused of copyright infringement is justified. But to the best of my estimation, a scholar in the caliber of Prof. Santiago wouldn’t lay about me if his work is appreciated for such a purpose that we have and within such circumstances. Justiniano Asuncion was elected cabeza de barangay in the community of mestizos in Sta. Sruz, Manila. For this reason, he was ever after fondly called Capitan Ting. The biographer Manuel Artigas y Cuerva jotted a 14-sentence sketch of his life and called him modelo de honradez, an exemplar of tacto y prudencia. Way back in the 1980′s, during my college years in Manila, my favorite psychology subjects were psychological testing (psychometrics), projective techniques, psychopathology, mental hygiene, theories of personality, experimental psychology and seminar on exceptional children. In projective techniques, the student learns the rudiments administering and evaluating personality tests. Throughout these courses, the student begins to be confronted with the question of personalities, the reality of individual differences, inborn and acquired traits, the nature of intelligence in all its theoretical aspects. But intelligence is something else. It’s requires more to gauge it. A mere glance cannot tell me if one is an average, genius or retarded (except for genetic abnormalities as Down syndrome, etc.). But this time, through indirect way, i.e. 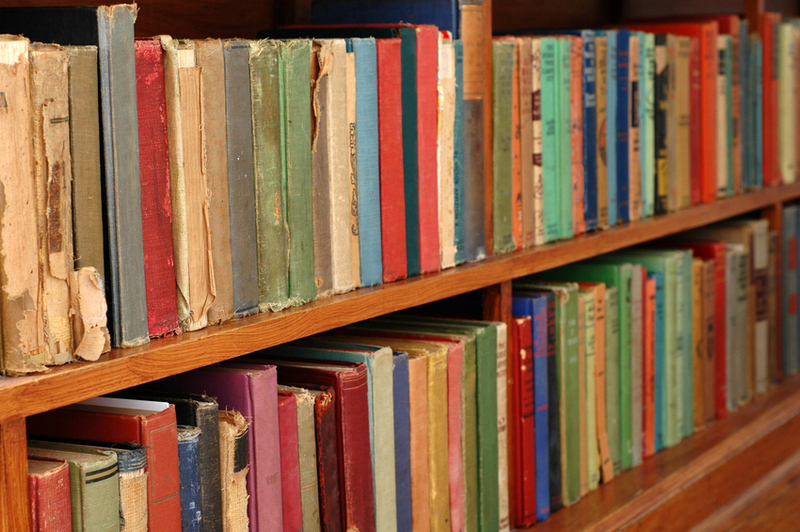 by way of a written piece or work of art, etc., I could tell more about the intelligence of the person. Had breakfast with neighbor Horace Gillego and he supplied me a copy of their family tree. In our previous emails last year, we mentioned that Horace pointed us to the Bulan Observer website of Jun Asuncion (Horace’s roots come from Bulan). Lately, Horace discovered in their late dad’s house an old folder which contained the family tree of Rafael Espiritu Gerona (died April 14, 1871) and Ma. Justaquia Gray (died Jan 1, 1873). The family tree traces the line from the Gerona & Gray union (they were married July 30, 1821). One of their seven children was Casimiro Gerona (married Zenona Antiado). Their union brought forth four children, the youngest Salvador Gerona (married Rita Gimpaya). And the latter couple produced ten children, one of them was Monica Gerona. Monica Gerona married Rodolfo Asuncion. Rodolfo Asuncion was one of the children of Zacharias Asuncion. Rodolfo’s mom is Zacharias’ third wife – Remedios Ramirez. Zacharias’ dad is Justinano. 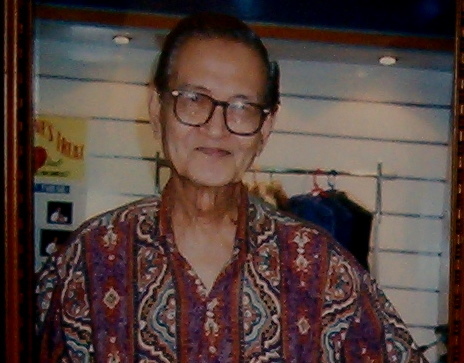 Zacharias’ grandpa is Mariano “Kagalitan” Asuncion. From Rodolfo Asuncion and Monica Gerona came papa Ronnie Asuncion. From Rodolfo’s brother Adonis came Andres Asuncion (dad of Andres “Jun” Asuncion & Malou Asuncion Lao). From Rodolfo’s brother Jacobo came Sor Marissa Asuncion’s line. Not a few art enthusiasts are under the mistaken notion that the 19th century album of watercolors depicting various peoples and costumes of the Philippines in a special collection at the New York Public Library is yet another version of the Damian Domingo album at the Newberry Library in Chicago, a misconception apparently stemming at least in part from a typed commentary on a small slip of paper appended to the album stating thus: “Artists: Damian Domingo and Justiniano Asuncion, according to Mr. A. Roces, July 8, 1980.”Further, an earlier notation presumably handwritten shortly after the album was completed, indicates that: “These figures were painted for the sake of the costumes by a native artist of Manila [sic] for M. Soden Esq. of Bath — in the year 1841 or 2 (9 in number). The other four by an inferior artist the former being ill. [signed M.M.S. ]“If we were to believe the 1980 notation that the artists were indeed Damian Domingo and Justiniano Asuncion, the logical assumption of most would be that the nine superior paintings were by Domingo, and the other four by Asuncion, who was the more junior of the two. 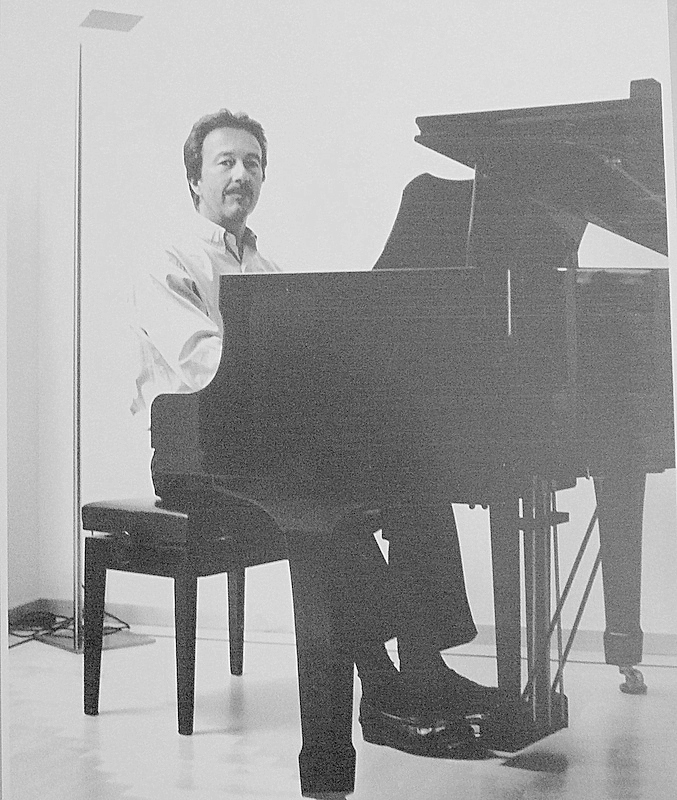 Closer scrutiny, however, disputes the attribution to Damian Domingo, for the rendering of the figures is distinct from that of the signed Domingo album in the Edward Ayer collection at the Newberry Library. Moreover, it is the opinion of many that Justiniano Asuncion surpassed his erstwhile mentor in artistic skill and virtuosity. It is therefore unlikely that the “other four by an inferior artist the former being ill” could refer to the talented Asuncion. Rather, the nine superior works are clearly those of Asuncion himself, and the four inferior works by another, unidentified artist.The handwritten notation placing the year of manufacture to the early 1840s similarly refutes authorship by Damian Domingo, who is said to have died a decade earlier in the early 1830s. A careful reading of the images, in fact, brings to mind the many unsigned 19th-century prints attributed to Justiniano Asuncion that are still seen occasionally offered for sale in various art shops today.Belonging to the genre popularly called tipos del pais, this album labeled simply as Philippine costumes consists of 13 gouache images of individual types and costumes of the Philippines on European wove paper, with three additional images that do not seem to belong to the set, namely fragments of an image of a Chinese lady, an illustration of different types of butterflies, and a print of a European hunting scene. The album was formally accessioned by the New York Public Library in 1927, although, even before this date, it was most likely in the collection of one of the three philanthropic institutions that were consolidated to create the core collections of the New York Public Library – namely, the Astor, Lenox and Tilden foundations.Ironically but most appropriately, I first experienced the Justiniano Asuncion album at the New York Public Library two years ago, on the afternoon of July 3, while in pursuit of Damian Domingo albums overseas. As with my first encounter with Damian Domingo at the Newberry Library in Chicago, I sat transfixed as the album was placed before me, prolonging the chase a bit longer, relishing the anticipation, savoring the warmth of the lustrous wood around me – the rhythmic rows of reading tables embraced by luxuriously paneled walls, the hushed readers consumed by their particular passions and obsessions. Subjecting the exquisite images to my trustworthy magnifying loupe, Asuncion’s distinctive rendering of facial features was magnificently revealed in consistent details otherwise invisible to the naked eye – a dab of red here, a bit of gray there, a dot of white strategically situated to simulate those vibrant, luminous eyes. Painted in a different style from that of Domingo, the Asuncion images appear more European in both features and skin coloring, in stark contrast to the Domingo images which are more Southeast Asian. Despite the marked stylistic differences between Domingo and Asuncion, it is clear upon careful comparison of the images of the Newberry and the New York Public Library that the types and costumes portrayed in the Asuncion album were inspired by, if not directly derived from, the Domingo album. Besides its artistic virtuosity, the Asuncion album is particularly valuable because of the copious handwritten notes accompanying the images. Thwarted by the Fourth of July celebrations during my first visit, I successfully completed my own transcription of all the notes during my second, longer visit last year. How little has changed today, from the lowly jueteng and small-town cockfights, to world-class government-sponsored gambling casinos similarly entrenched, siphoning hand-earned monies to line the pockets of some morally decrepit few! Certainly not a very inspiring image of the ideal Romeo, but most likely gifted with such charisma as to render hapless ladies oblivious to such deficiencies. Nonetheless, one must keep in mind that these commentaries are from a western, presumably male, perspective – male colonial gave undoubtedly swayed by the legendary charms of the winsome Filipina. How much or how little out world has changed since the 1840s! Early in life I have learned to accept that some things shall just remain as dreams, as persistent longings that I’ll be carrying around. Since the start of this search for my Asuncion roots, my longings to know more about my fathers (and mothers) and to find any related information have intensified. And how my great grandfathers may have looked like have greatly preoccupied my imagination but came to terms with the fact that this was all to it and nothing more since even the known self-portrait of Justiniano Asuncion was lost. I thought that was all, lost forever. I thought, but I did not know. I did not know that a certain family by the name of Quintos – Guirzon have been keeping my dream in their photo collection and that one day I’ll be receiving a copy of it from my cousin Ding Asuncion. Unbelievable but this time it was true. I admit that in my age, even a lightning strike wouldn’t make my eyes bluesy and wet. But that moment when the image unfolds itself by the click of the mouse, I lost almost a river of tears from this great joy and this feeling of reunion with my ancestral roots. I was speechless when I saw the faces of Justiniano, Zacarias, Benita and Jacobo! Zacarias is my great-grandfather. What I remember to have seen in my childhood was just a piece of Zacarias’ gravestone in our compound in Canipaan which unluckily I didn’t find anymore when I came home a few years ago. When times were getting rough for the Asuncions in Binondo, Zacarias left for Bicol in search for new possibilities. A different time, indeed, for who would think today of going to a distant town of Bulan in search for better opportunities? 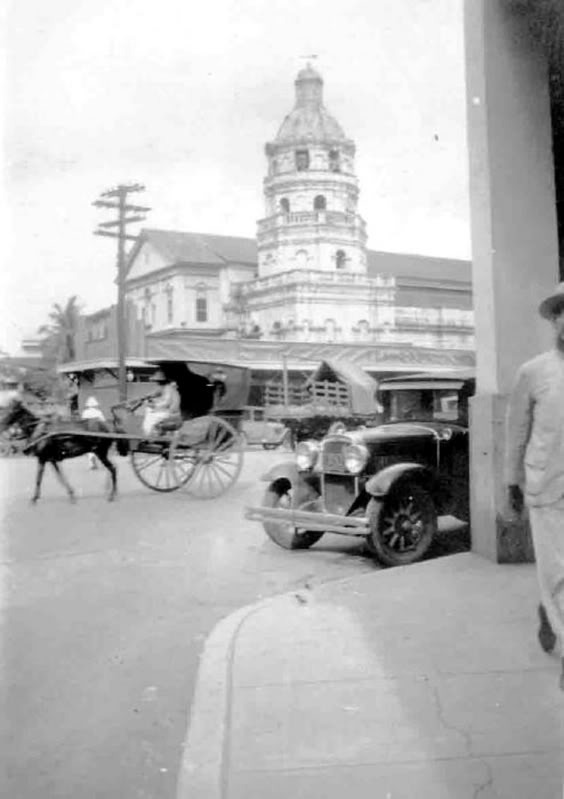 Whatever his true motivation was, Zacarias’ travel estbalished the Asuncions’ connection with this town. It was my younger relative Christopher Yatco who first drew my attention to the existence of a new book about Damian Domingo with the photo of Justiniano and his children. My excitement soared even beyond the moon. But being out-of-town, I still do not have this book. And then, a few weeks after, Ding Asuncion, grandson of Kenerino Asuncion and Lola Leny, sent me this copy of the photo together with some excerpts of this book. It was ca. 1894 when Schultz’s mixture went off into action which today – 117 years later – would have a profound effect on many of us, up to this very moment as I try to write while poring over this photo which seems to me a gift fallen from heaven. I’m highly indebted to the prime mover of this event, Hilarion Asuncion, the man behind the camera, my great grand-uncle and for all those good things and chain of events that worked together – in obedience to the inner logic of Asuncion’s fate – that ultimately preserved this image over a century, over these rough and repressive times. If artistic genius was in the Family of Justiniano Asuncion and so was community leadership, I think. It was due to Zacarias’ successful Bulan’s adventure that brought Justiniano Asuncion to Bulan, already old and grey, a man behind the sparkle of success, within the silhouette of death. Bulan became his refuge, the sanctuary of his tired body and soul and the gate to his eternal rest. If the biographer Manuel Artigas called him “modelo de honradez, an exemplar of tacto y prudencia”, then it was an honor for Bulan to have such qualities be buried in its grounds. For these qualities had to come out again forty-five years later after his death in the person of Adonis Asuncion, my grandfather, who became Mayor of Bulan in 1941. My grandfather Adonis Asuncion had led Bulan not in times of political Padrenos, vote buying, plundering and pork barrel but in times of foreign aggression where one must have to defend the basic rights of Bulaneños. So my fathers were community leaders when three superior nations ruled our land; Justiniano in Sta. Cruz during the Spanish time, Zacarias in Bulan just at the beginning of the American rule and Adonis, also in Bulan, during the Japanese occupation. All three men had their share of what I call the roughness of times but all came out hardened in their character, in their convictions. From their stories I learned the lesson that political leadership is about self-respect in the first place. Methinks that the political, civil and military leaders of today who are now facing corruption and plunder charges had failed to respect themselves and their very own families in the first place. Hence, how could they ever respect the community of people they don’t personally know? The Japanese bombed Manila and that seminary where he was one of the three candidates for ordination. They had to separate ways and Pa went home to Bulan to his family, where his father Adonis Asuncion was the town mayor. He walked from Manila to Bulan, Sorsogon for around three weeks and survived the hazards in the streets, especially that critical moment when from under the tree trunk suddenly came out a handful of Japanese soldiers, stopped him, asked questions and inspected his backpack. “I remained quiet, and the officer caught an eye at the shaving blade (Labaha) I had and took it in his hands…(now the officer could have just swung this blade to his neck, if he wanted to.) He seemed to be interested in it so I just nodded my head and they let me go!” Wow, Papa would have flown like a bird if he could at this moment. Kidding aside, I thank this officer so much for letting my father go and, in retrospect, I respect this Japanese officer for his intuition. He must have felt that Pa was not an enemy. And, indeed, Pa did not kill a single Japanese soldier! Now the thing is, if you are proud that your father killed hundreds of Japanese soldiers at that time, I support that for it was wartime, and your father was destined to kill. That my father came out alive without harming anybody’s life, I’m certainly proud of this; he was simply not destined to kill. He was true to his convictions and fate was true to him whole life long. That unknown gentle Japanese officer was right. Last Saturday I picked up Sor Marissa at her sister’s house, Dr Numen Gonzales, we were then to proceed to Noel’s (my brother) place. At Dr Numen’s house I met one of our second cousins Xavier Asuncion (son of Roberto Asuncion of Bulan). Roberto is the oldest sibling of Sor Naty Asuncion, Dr Iluminada “Numen” Asuncion-Gonzales and Sor Marissa Asuncion. The siblings are the children of Jacobo Asuncion (Jacobo married to Trinidad Rosales). Jacobo Asuncion’s siblings include Adonis (line of Jun Asuncion ), Justiniano (founder of UPSILON), Kenerino (founder of Southern Luzon Institute: Kenerino Ramirez Asuncion Memorial School or SLI-KRAMS) and Rodolfo (married to Monica Gerona and dad of papa Ronnie). Jacobo, Adonis, Justiniano, Kenerino and Rodolfo are five of the thirteen children of Zacharias with Remedios Ramirez (based on the copy of the Asuncion family tree I have)..
1) Zacharias had a second wife after Juana Zalvidea & before his wife Remedios Ramirez. Her surname was Loilo. They had a child, but the child died, and in the Asuncion family tree we have, no mention of their names appeared. 2) Zacharias must have done well in Bulan, as he was able to send his children to Manila to pursue higher education. According to Sor Marissa, when Kenerino came back to Bulan after college in UP, he was shocked that his elementary classmates never got to higher education (no high school and no college). That inspired him to establish the Southern Luzon Institute, which later became SLI-KRAMS. The information is interesting; because we know our great grandparents (generation of the children of Zacharias) got to finish college, so that must have been in Manila . And if there was no high school in Bulan then, they must have been shipped to Manila for high school at an early age and on to college. In a past family get together, Auntie Nellie Intengan Jocson remembers her mother Consuelo Asuncion and aunt Ghia Asuncion (both daughters of Zacharias with Juana Zalvidea) were brought up by their unmarried aunt Benita, the older sister of Zacharias. Since Consuelo & Ghia knew Bicolano, can we assume they took their elementary schooling in Bulan? Was their aunt Benita also in Bulan during their elementary school days? Or was Benita the guardian of Consuelo and Ghia when they had to go to Manila for high school? Who took care of their siblings Jacobo, Adonis, Justiniano, Kenerino, Rodolfo when they too had to go to Manila for high school and college? Hope the other Asuncions can help.